Camila Marichal graduated from Purchase College with a BFA in Printmaking and Photography. 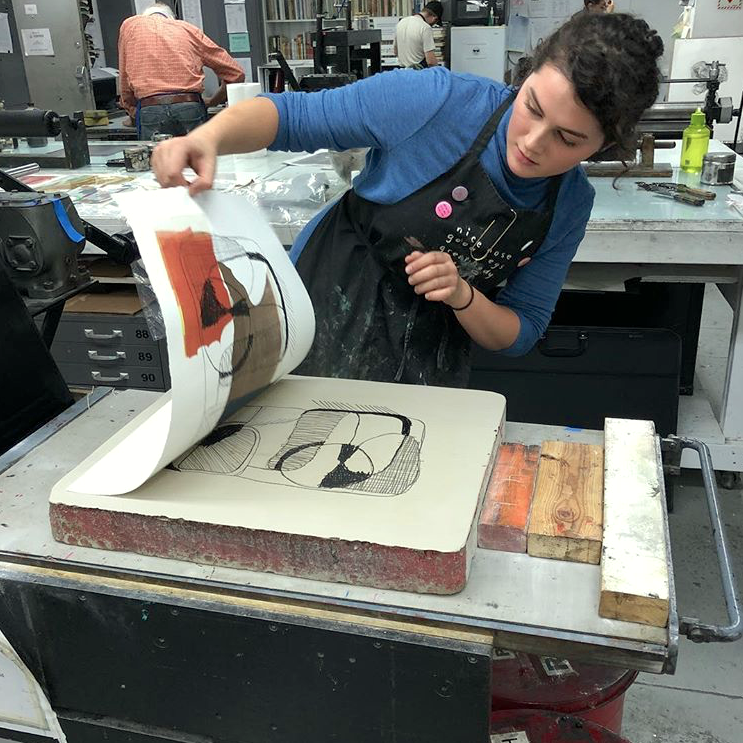 They are trained in a variety of printmaking techniques and use mainly screenprint, monotype, relief, and photographic processes in their own artistic practice. Lili Loy graduated from Pratt with a BFA in printmaking. She is experienced in a variety of techniques including etching, lithography, and letterpress. Her artistic practice utilizes a mix of digital media and printmaking. Julia Sorboro is an Ohio-born artist, currently living in Brooklyn. She specializes in lithography and collage. Khalif Tahir Thompson’s work incorporates painting, drawing, collage, printmaking, and paper-making into his practice, he explores notions of self through race, sexuality, and spirituality. Recently he graduated from Purchase College with his Bachelors in Fine arts degree and completed a fellowship here at the EFA Robert Blackburn Printmaking Workshop last Summer. Cecilia has been a monitor at Robert Blackburn Printmaking workshop since 2014. She specializes in relief, etching, and screen printing. Vincent graduated from Cornell university and works as a studio assistant at Harlan & Weaver and Small Editions. Their work includes drawing, watercolor, calligraphy, stone seal engraving, print, and book arts. Anh Ta is an artist from Hanoi, Vietnam. She received her BA in Studio Art from Augustana University and her MFA in Printmaking from Ohio University. Besides her studio work and working with other artists, Anh has brought her artistic expertise to various settings including design firms, cancer hospital, orphanage school, private school, and university classes. Anh is well versed in traditional printmaking processes, with strong emphasis in intaglio techniques. She has exhibited widely within and outside the United States.